A week or so ago I was honoured to attend the Happiness & It’s Causes conference here in Sydney. I managed to pack in over 25 incredible speakers in 2 days plus a 3 hour workshop. Did I mention that I L.O.V.E to L.E.A.R.N by the way? I’m happier than a little pig rolling around in poop when I’m up to my ears in new information, knowledge, wisdom and insights. So this bode well for me at the Happiness conference, where there was hour after hour after speaker after speaker…each spewing out their own life’s work into a neat little 20 minute package. Wow I’m lucky to get to soak all of this up. If I’m honest, there were so many insights and nuggets of wisdom that I’ve been wondering how on earth I might relay all of this back to you my dear readers. Afterall, what’s the point of knowledge if you don’t share it? So….I thought instead of trying to capture everything into a really long blog post that would just be overwhelming, I thought it might be more helpful for you if I distilled everything I learned into my top 20 quotes from the speakers. These guys know a thing or two about happiness. And how to get it. Many of them have dedicated their entire lives to the study of this subject – so if you’re like me, you might feel pretty privileged to hear what they have to say. Here we go….feel free to go ahead and tweet or FB your favourite quotes. I’ll be sharing them over on the Simple Life Strategies Facebook page and Twitter – so be sure to join in. Oh and by the way, I have it on very good authority that his holiness the Dalai Lama will be at next years Happiness & It’s Causes event. Oh Em Gee. This makes me VERY very excited indeed. I have already scheduled it into my calendar for next June. Tickets aren’t on sale yet so don’t worry – I’ll remind you about this closer to the date. Mihaly is the world-leading researcher in the field of ‘flow’. He’s dedicated his whole life to understanding how and why we enter a state of flow. Interestingly Mihaly talked a lot about the importance of self-expression and how this plays an integral part when we’re ‘in the flow.’ We need to be able to fully express our true nature in order to achieve happiness. This is why when we’re in a job or career that doesn’t align with our values, we feel so much frustration and unhappiness. What are you doing when you’re in the flow? How can you do more of this? Mihaly has found that when we’re in a true state of flow, we’re not focused on an end reward – it’s auto-telic. This means that the ‘experience we’re having becomes its own reward.’ In other words, we love what we are doing so much that we would do it just to have the experience….regardless of what happens at the end. If you think about how this rings true for people who have become successful by living their passions you can see a strong correlation here. They would do it over and over again – just for the hell of it. There is no desire for ‘success’ or ‘money’ or ‘fame’ – there’s just pure passion for what they are doing. Known as ‘the happiest man in the world’, Mathieu is a Buddhist monk famous for his work on altruism. He talked about the idea that our own personal happiness alone cannot create true fulfillment. We need to extend this to include the happiness of others. We need to develop a sense of compassion and this is what will provide us with the happiness that we seek. Mathieu shared research that shows the brain literally changes after only two weeks of meditation. Studies have shown that the structure of the brain will change in those areas that are related to compassion – and all that was required was 20 minutes of meditation each day. It’s quite incredible to think that our brains will literally change based on such a simple practice. If you haven’t yet tried meditation, now might be the time to give it a go. Jean has studied the effects of Narcissistic Personality Disorder (NPD), an epidemic that appears to be increasing each year. In an era of selfies and social media obession there even seems to be a perception that we ‘have to’ be somewhat narcissistic if we want to become successful. We have to get ourselves out there and show the world what we’re doing. The truth is – narcissists don’t live up to their own hype. Jean’s studies have shown that surprisingly, narcissists are no more successful than anybody else. And contrary to this, more humble, team oriented leaders are actually more successful in life and business. After being diagnosed with terminal cancer, Petrea sought to understand the meaning of life and how happiness plays a part. She shared into her realisation that ‘we postpone our own happiness.’ Otherwise known as the ‘I’ll be happy when’ syndrome. We fail to experience our present level of happiness in exchange for a distant happiness that can never be reached. How often do you utter the words “I’ll be happy when?” Is it time to start focusing on your present level of happiness? Roy is the leading authority on the subject of ‘willpower.’ His research has shown that there is a direct correlation between how much discipline or self control you have and how successful you will be in all areas of your life. Interestingly Roy’s studies have found that we have a limited amount of willpower each day – that gets used up. He describes it as a muscle that gets tired after exertion, but can be strengthened through regular exercise. How much self control do you have and how can you start to strengthen your own willpower muscle? Maybe it’s time to start that new health regime or get up earlier? Roy talked about how willpower is also strongly tied to decision-making and we can experience what is called ‘Decision-fatigue’ usually at later stages of the day. Once caught in the grips of decision-fatigue we are more likely to make poor decisions due to a lower IQ and a natural impulse to self indulge. So make sure you make your important decisions early on people! Or better yet save your willpower to only make the important decisions. Have you ever noticed how President Obama only ever wears blue & grey suits? Why? One less decision to make of course. David talked about having the attitude of a ‘curious botanist’. He shared a study that demonstrated our complete lack of presence – 49% of the time we are thinking about something other than what we’re actually doing. Think about that for a moment. We’re just not present. And the research has shown that it’s actually those moments when we are present or in the flow (as Mihaly has shown) when we experience true happiness. I’ll be sharing my interview with the lovely David Michie on Simple Life Strategies TV soon so stay tuned for this. Known for her lifelong work with chimpanzees, Dr Jane Goodall shared a fascinating piece of research that showed when our basic human needs are met, our happiness index is higher than when we desire more than our basic human needs and actually achieve more. So – in a nutshell it’s the desire for more than we have and the attainment of this that actually creates the dissatisfaction that we are so desperately avoiding. Dr Jane expressed a desire for us to think more carefully about the choices me make and to do our best to somehow make a positive difference in the world. Felicia is an international expert in the science of wellbeing and she shared some really exciting studies that show how an 8 week course in mindfulness can increase the amount of grey matter in the left hemisphere of the brain resulting in greater compassion, self awareness, positive states and even a more effective immune system. Mindfulness has gained so much credibility as a practice that it’s even being taught in UK Parliament to help politicians lower their stress levels. I love this! Mindful politicians! Is that an oxymoron? Money is a topic loaded with emotional undertones and Bernie Bolger talked about how taboo this subject has become in the west. Her advice for a happy relationship? Financial independence of course! And the 5:1 ratio rule. What’s this? It’s where for every 1 negative thing you say about your partner, you must follow up with 5 positives. Love this. And if 5 is never gonna happen for you – then aim for 3. 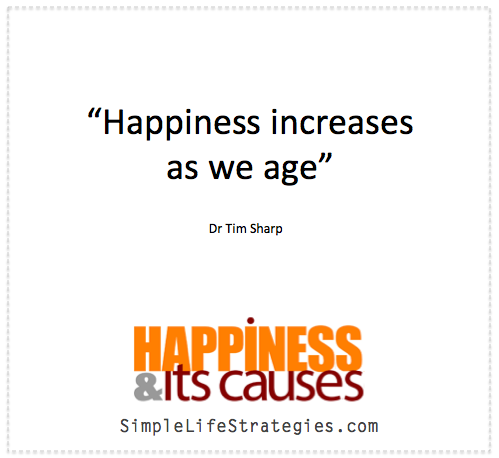 Tim has recently conducted a wide range of studies into perceptions around age. He’s found that despite a reluctance to grow older, our levels of happiness actually increase as we care less and less about what others think of us and other superficial problems. Interestingly, he found that in certain areas of the world such as Okinawa people live longer, are happier and healthier because they have a strong purpose in life. Do you know what your purpose is? Maybe it’s time to get clear on this. Hugh talked about how the meaning of our lives is relationships with others. We must give up on the idea of utopian perfection and go on a quest to understand who we are. Relationships are inherently messy things and the dark times equip us with empathy. According to Hugh, a meaningful life is not necessarily a happy life. And for a life to have true meaning, we must tie it to something bigger than our own personal needs. Parents are apparently most happy when they are not with their kids, but they get the most meaning out of being a parent. Born with a giant tumour on his face and twisted legs, Robert Hoge has been on a journey to overcome incredible hardships. Immediately after he was born, Robert’s mother sent him away without seeing him. She refused to see him for the first week of his life and only agreed to take him home after putting it to vote at the family dinner table. This is heartbreaking stuff. Despite this and severe bullying at school, Robert talked about how he has managed to make peace with who he is. If he can, then we should all at least try. Known more commonly as a famous Australian media personality, Deborah Hutton has recently moved into the wellness space with a mission to help women become more balanced. Talking candidly about her glamorous jetset lifestyle, Deborah confessed that her constant desire for perfection took away from a lot of the fabulous experiences in her life. It was only when her career started to dry up and she had a close call with skin cancer that she began to realize what was really important to her and who she really was. What can I say. I just loved this guy. Such humility and such an incredible story to share. Tim Cope undertook a treacherous adventure on horseback alone from the nomadic lands of Mongolia all the way to the Danub River. The three and a half year journey that Tim shared showcased how unbreakable the human spirit can be when we’re aligned to our purpose and something we really believe in. So there you have it. Happiness & Its Causes in a nutshell. Such an informative, insightful, jam-packed event. And you know how sometimes these conferences can be a bit stale or dry with too much research & facts? Well this one got the balance just right with some really light-hearted, fun speakers and plenty of science & brainfood too. I’m excited for next year. Oh and I’ll be sharing some video footage of the speakers in the next few weeks. Tell me – which quote stood out the most for you? Let me know in the comments below.